I have a lot of neutral polish colors, but I always seem to get distracted by other, brighter colors and forget to use them! 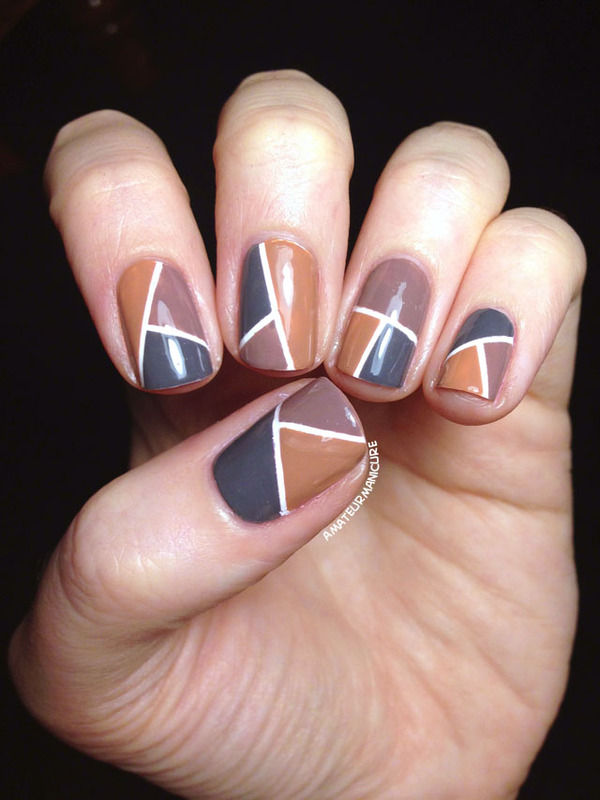 So I decided to use multiple neutrals all at once and really make an effort to feature them in this manicure. I started with a base of Zoya Purity (two coats) and let that fully dry. Then, one by one, I put two pieces of striping tape on each nail in various random arrangements and carefully painted the three resulting segments with three FNUG polishes: Cashmere Sweater, Fashion Show, and Flat Boots. As usual, I started with my thumb, so that's where most of the mistakes are (streaks, uneven color, etc. )—I really should wise up and start with my pinky finger one of these days! I also just used the brushes from the bottles, which worked okay overall, but was a bit tough in the tight corners. If I do this sort of thing again, I'll probably use a smaller nail art brush for at least some parts of the color blocks. Everything is topped with two coats of nails inc. Kensington Caviar.